Having a tattoo in the Philippines means that you are already subject to discrimination. As someone who has five tattoos, I’ve been there. Many jobs require that you do not have any tattoos, or visible tattoos, no matter how competent you are for the job, you will not be accepted solely because of having a tattoo. There is also some judgment placed by employers to applicants with tattoos whether or not it is required that you shouldn’t have a tattoo. You might get discriminated by people around you, your classmates, co-workers, etc. Many parents don’t allow their children to get tattoos for various reasons, but mainly for the prevailing stigma attached to having tattoos. Here are some arguments that aims to convince those who judge and discriminate, to think otherwise. Many have said that you can never donate blood once you get a tattoo, or some say that you can after 10, 5 years. 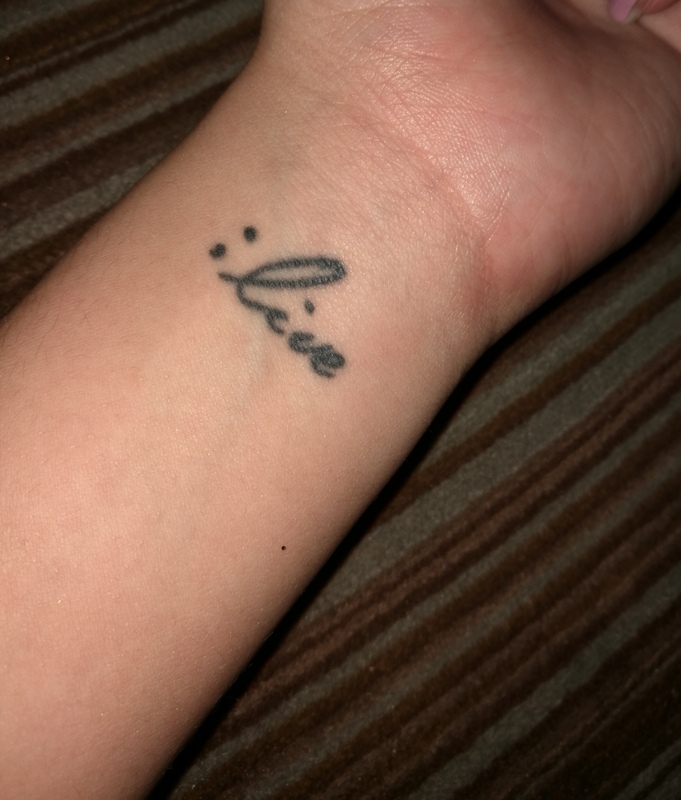 Actually, I encountered a nurse in The Medical City Ortigas, who had a tattoo. I was so curious as he was the first nurse I’ve ever seen with a tattoo. I asked him how long the period really is, before you can donate blood. He told me that it would take a year and a half, yep, not forever! 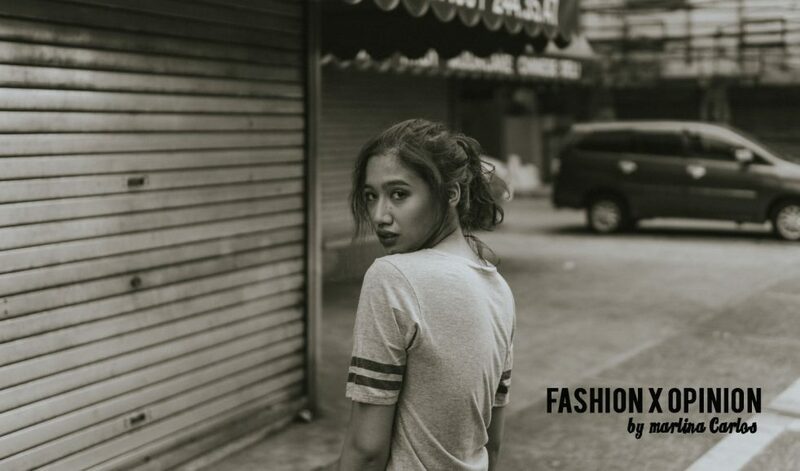 Since the cultural significance of tattoos in the Philippine History has long been ignored, and not taken into consideration by many. I feel that it is time to get personal. I have five tattoos, all representing my principles, that I hold deeply in my heart, and important moments of my life. This was my first tattoo. It says ;live it is placed on my wrist, where you usually check your pulse. I got this a month after I was diagnosed with clinical depression. 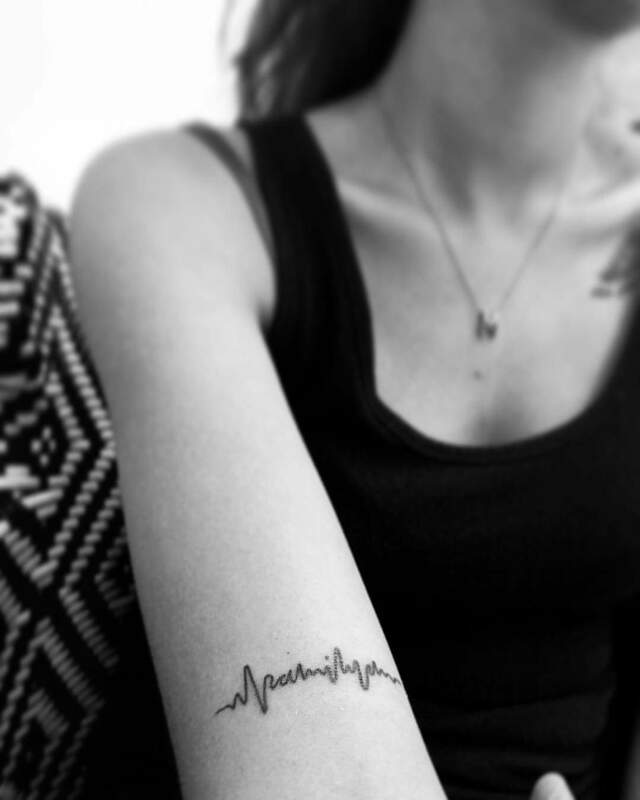 This tattoo symbolizes my desire to keep moving and living. A semi colon is a continuation of a sentence, instead of putting a period, you chose to keep writing. This tattoo shows me everyday, that I should continue to live, no matter how much darkness takes over my life. This was my second tattoo. The name of my grandfather, and the years he spent on this earth. I got it the day my papa had died, just an hour after we all had to say goodbye to him at the funeral home, before they would embalm him and completely change his body. When it was done, I went directly to my tattoo artist. I got it because he was my grandfather, and he is the only father I had, and I couldn’t, not even for a second, bear the thought of him not being by my side. They say getting a tattoo on your ribs is one of the most painful places to get a tattoo, because there’s only thin skin and almost no fat covering up your bones. I purposely got this tattoo on my ribs because I feel like that way, he is written deeper into me and my bones, and he would be closer to me. This was my third tattoo. It was actually the only one I had really planned on getting. 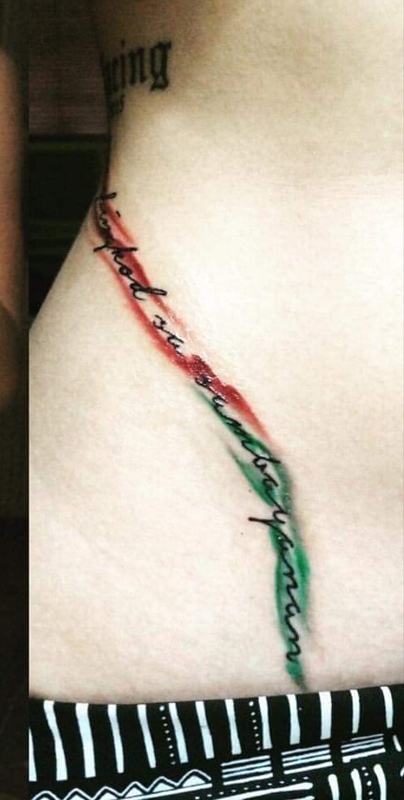 It says “maglingkod sa sambayanan,” or “serve the people.” The tattoo is colored in maroon and green, the colors of my school, the University of the Philippines, It is placed from my ribs to my hips, resembling the “Sablay” we used on our graduation day. This university is where I learned all that I know about the struggles of our countrymen. This is the place where I found my passion for service. This tattoo is a daily reminder, that I should never turn my back away from my country, and that I shall live my life serving the Filipino people. 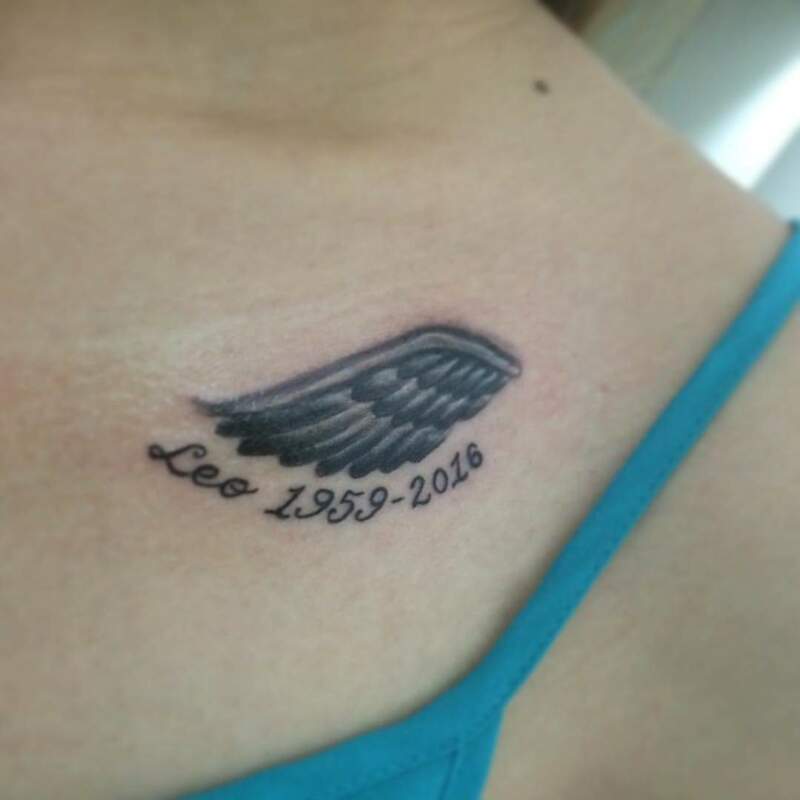 This was my fourth tattoo, a broken angel wing that resembles half of a heart, with the name of my uncle Leo, and the years he had lived on this earth. He passed away 2 months after my papa did. He was also a father to me, and suddenly he was gone too. He was (and is still) an angel, a loving and kind human being. But he was broken, his heart was literally, broken; he was diagnosed with cardiomyopathy 15 years before he passed. He was actually one of the lucky ones, who lived significantly longer than others with the same condition. 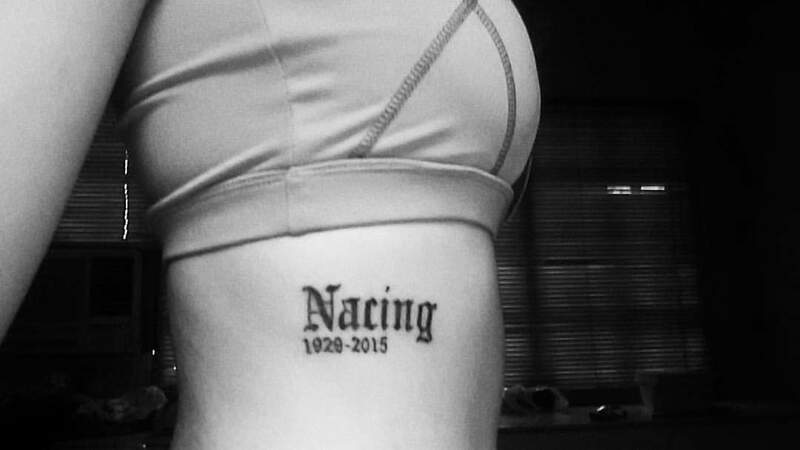 All of these is why I put this tattoo close to my heart, because even if his heart was weak, which is why it doesn’t beat anymore, mine will always beat for him. This is my fifth, tattoo a hearth rhythm symbol, but if you look closer, it spells “Pamilya” or “Family.” After all of the emotional turmoil I had gone through with losing my dads, with my depression, and dealing with all of the pains of my past; I know, that the only reason I am still here, is because of my loving mother, my amazing siblings, and all of the people even not related by blood, that I consider as family. So yes, my heart beats for my family, and is also literally still beating, because of my family’s love and rescue. Tattoos mean different things for different people, but no matter what, this shouldn’t be a reason for us to judge. There is always a story, behind the ink. Tattoos do not hurt anyone; but the judgment? It does. The discrimination? It does. Getting tattoos isn’t a vice, it is a way of expression through art. At the end of the day, the mere fact of having tattoos should not define a person. But unfortunately, many still do judge the book by its cover.